I have been putting off writing about the plays, concerts, lectures, and dance I’ve been to since coming back from Milan (well I did just once because Friel’s Translations was not to be missed) that they have begun to pile up. So late as it is, I’m here to urge all who read this to see the RSC’s Hamlet with a nearly all black cast. It is touring. Allowing for exaggeration, the reviews have (rightly) said that Essiedu makes the experience what it is (Telegraph (several of the actors were superb, especially Clarence Smith as Claudius, James Cooney as Horatio, Mimi Ndiweni as Ophelia): a new star is born; Washington Post: a rogue outsider artist). But I’d like to qualify that and say its strength is the same as the deeply felt Folger Winter’s Tale, which I saw two weeks ago now: The Folger WT also had some great acting: Michael Tisdale as Leontes, Melissa Graves (an understudy) a poignant dignified Hermione, Eric Hissom, any number of linked characters (Camillo, Antigonus, Storyteller Time). More important: the directors of both productions allowed the actors to do Shakespeare straight on. Both are despite some exhilarating African music and modernized songs and dancing in Bohemia traditional productions. I can never have too much Shakespeare. By the time we got to the final scene of Hamlet, I felt the awe, the wild exhilaraton, and savage ironies Shakespeare intended me to feel. In the last scene of The Winter’s Tale, I felt a grief akin to what I nowadays feel when I see King Lear. 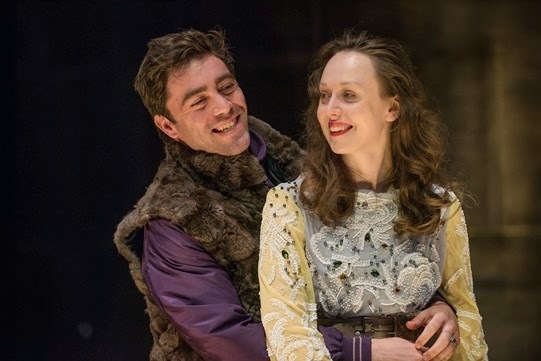 In Lear death is the final blow of a harrowing of cruelty and madness; in The Winter’s Tale, we are awakened to a joy we cannot quite believe as “oh she’s warm” is pronounced. I wish this Winter’s Tale had gone on tour. When they are this good, I often hope to myself that they have filmed it onto a digital device. The most intellectual and stunningly moving experience was Ivo von Hove’s After the Rehearsal and Persona at the Kennedy Center. Gijs Scholten van Aschan in the Bergman role and in the first play Marieke Heebink as his wife, contemporary partner, an aging actress (alcoholic, depressed) who needs him more than he does her (and he needs her) and Gaite Jansen as the young substitute (possibly pregnant and not sure she wants this life), taking over. In the second Heebink is a mentally shattered woman, with Anne her young nurse: after much manipulation and emotional attacks, the two see themselves in one another. The plays (originally done on TV are about the destructive and therapeutic function of art in a dedicated artist’s life. Hove is superb at Bergman material (like the corrosive effect of growing old) getting his actors to release the vulnerable and angry self. The same actors played the parts in the Barbican; it was in Dutch with surtitles. The stories were not intended to comment on how men use women in the arts, but they do, prophetically. The sets and stage business was so poignant too: the second ended in both women standing in a large pool of water, together, in simple white shifts, holding hands. As to concerts, dance, our local small Metro-stage in Alexandria provided a warm delightful presence in Deb Filler, a New Zealander Canadian Jewish storyteller doing all sorts of traditional sons “her way;” in Yiddish as well as English. You haven’t fully enjoyed Leonard Cohen’s Hallelujah until you’ve heard Filler sing the song in Yiddish too. Writer, actress, singer, comic, musician, hers is a one woman entertainment, stretched out with some film. She was the third of three women solos this spring at Metrostage (Catherine Flyte (scroll down), Roz White (ditto)). And to tell the truth, more than the Folger Ovid’s Vineyard. They had a soprano singing from two operas, Phedre et Hippolyte, and Orphee, a man brilliant on the flute, a rich harpsichord and a woman who worked very hard on her violin, but still it was tame except for the unexpected beauty of the melodies of Jean Philippe Rameau’s concert songs for harpsichord. The Folger Concert has not been as inventive this year as previous. Perhaps I should start to go to the pre-performance discussions. 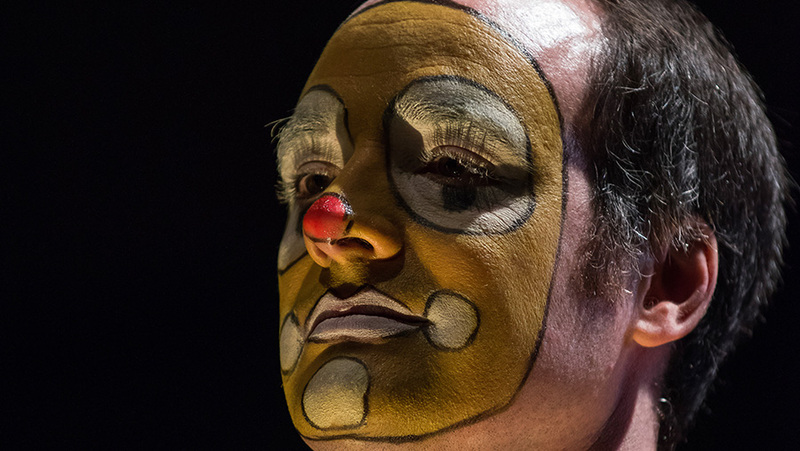 I did go to one dud: the Scottish ensemble and Anderson Dance performing the Goldberg Variations at the Kennedy Center was an in-your-face insult to anyone with sensibility. After the Milanese Goldberg Variations at La Scala as stunning beautiful — graceful, lyrical, interestingly psychological, wonderful group patterns — this group fobbed us off with comic grotesquerie and awkward individual non-dances. If I had been on the aisle, and hadn’t gone to trouble to see it, and hadn’t kept hoping at some point there’d be dancing, I’d have left after the first ten minutes. Although I’ve not gotten to the exhibit at the National Gallery, I did go to a long full lecture (many good slides) at the Smithsonian on the Cezanne portraits. I bought the ticket and went to the Hirschorn in the hope I would be taught why I should like Cezanne’s art. I don’t: it seems so inert. Roger Fry loved it, and I’ve friends who say they do too. To me Cezanne’s paintings seem made up of empty abstract forms, even if “monumental,” and he leaves me cold; the portraits often lack faces. While curator told of interesting relationships between Cezanne and his sitters, and said there were several versions of a given portrait at this exhibit so you could study the differenes, she never answered the objections of several reviews of the show, e.g., one in the Washington Post by Sebastian Smee, and three very respectful questioners in the (crowded) audience. Madame Cezanne as painted by Cezanne has been vilified for not smiling (women are supposed to be joyfully compliant at all times). Smee omits that Cezanne was the son of a very rich man who supported Cezanne all his life, so his choice to paint peasants — and to live with one and mistreat her for many years (she was left isolated) before finally marrying her has a certain hypocrisy. The curator offered the idea these are iconoclastic portraits, modern, refusing to satisfy us or glorify the sitter. Well in the Cezanne cases (unlike the same thing seen in Vanessa Bell’s portraits) these are not rich customers buying a pre-photographic portrait to glorify themselves. I become irritated when people complain about Cassandra Austen’s second portrait of Jane Austen where Jane is not facing us. She has the right to look away; it’s a trope of reverie in the period — you can find the same pose in front of novels. But when Jane was facing Cassandra, Cassandra drew her face. A friend on my WomenWriters@groups.io list wrote she had read that the faceless portraits reflected how humans/individuals are unknowable. We can think of Woolf’s de-centered novel Jacob’s Room, where similarly, we never get a clear picture of Jacob; it was said Woolf was inspired by Vanessa’s painting at the time, in particular her faceless portraits. I’ve left for last and now just briefly the fascinating four part adaptation of E.M. Forster’s Howard’s End by Kenneth Lonergan. Sometimes nowadays TV offers us far richer experiences in film, music and art than what is found in physical theaters. I don’t think this production was that superb but when compared to the Merchant/Ivory/Jhabvala (see Samanthan Ellis’s ironic take) and it is quite different from the original book; still, it was thought-provoking with its own new genuine feeling, intelligent, meaningful. Who would not feel for Leonard Bast after this one?. but the more recent film is more deeply empathetic towards the failing Leonard Bast, and makes explicit how these privileged wealthy people live off the undercompensated labor of others. I hope to write separately and with more detail than I have here when this summer on TrollopeAndHisContemporaries@groups.io we read the book together. I bring the new version up here to mourn that it did not appear on PBS (which sticks to inferior mysteries and thinner contemporary books and stories) but Starz (a high tier channel and too expensive for many people). I am watching the second season of Handmaid’s Tale but will hold off any comment until I’ve reached the end. I hope no one takes any of my blogs as here to give the impression I am living a good life, surrounded by friends or whatever is the going ideal norm for existence for a woman like me. It is far too late for me to come near a fulfilling existence for myself now, if it ever were in the cards. I was exhausted last night, falling asleep in front of a movie, couldn’t read Virginia Woolf’s A Sketch of the Past (her memoir printed in Moments of Being), so I reached out to others with material I thought might find acceptance and be of interest to those who come to this blog. Add something that might cheer or help others and that might prompt them to write back in a similar spirit. Last night The Folger Consort, put on a truly enjoyable concert of 18th century music appropriate for the winter season, “The Season Bids Us.” It consisted of four pictorial (in the 19th century way of music) Four Seasons (Scherzi Armonici sopra le Quattro Stagioni dell’Anno) by an early 18th century French composer variously called Antonio or Mr Antonio at the time. The Folger gave his name as Giovanni Antonio Guido; born 1675, from Genoa, studied violin in Naples from 1683; was employed at the city’s Conservatory, paid as a copyist, a violinist in the Royal Chapel and moved to Paris in 1702. There he became successful enough to end the head of the Duke of Orleans’s musical establishment. He was painted by Watteau. The four movements of Four Seasons, each have subheadings which suggests a story, and the Folger Consort group printed four French poems (with facing English translations) which correspond to the changes of story line in the music. 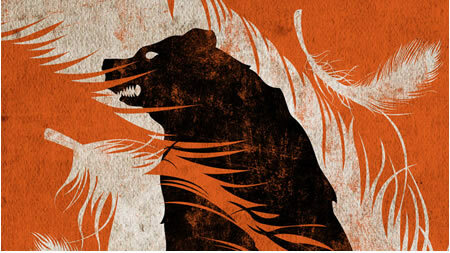 You can follow along from mood descriptions of the season, to events occurring in the natural world among animals and people (including a fierce hunt where the poor stag is destroyed no matter how hard he tries to escape). The consort used to consist just of four older (white) men; it’s now about 10-12 people, some young, women, African American. The older men are still playing their harpsichords, recorders, older violins, cellos, and period instruments I can’t name; the new people have older instruments too, but also modern violins, cellos, horns. For this concert and I can see those coming next year each time a “star” instrument performer is hired. This time it was the stunningly good Julien Chauvin. He can play that instrument wildly and it becomes alive with feeling. They also had a soprano with a beautiful voice, Rosa Lamoreaux. Between the first two seasons she sung carols using the Christian mythic story by Marc-Antoine Charpentier, a French composer active in Paris in the middle to later 17th century. I was a musician, considered good by the good ones, scorned as ignorant by the ignorant … since those who scorned me were more numerous than those who lauded me, music became to me a small honor and a heavy burden. and just as at my birth I took nothing into this world, I took nothing from it at my death. Has already met Leo in wrath. The stag, horrified, sees no escape. He flies, attempting in vain to escape death. Only snow and icicles that are found in every place. Pericles is still on at the Folger theater and the audience was probably too large for the Folger Theater, so it was held in a church across the street, the American Lutheran Church of the Reformation. The main nave is beautiful: simple, very Renaissance in the use of wood decoration, the forms across the ceiling reminded me of women’s headdresses. Four Christmas tree with white lights, wreaths without any ornaments. Most of the time Jim and I did not go to the consort because (he said rightly) they were dull about 10 years ago or so, the four men just using religiously the instruments of the time, sticking to the way a song might have been done. Once in a while though they would break out. I remember seeing a delightful rendition in the small Folger theater itself of Milton’s apparently stern Comus: it’s a play meant to be done in an aristocratic house by children. For that they did hire actors, and had extra more modern instruments — after all it was mid-17th century, 100 years after the “official” Renaissance. I see coming up in spring, “Playing with Fire,” a consort similarly inventingly combining different kinds of instruments and players: made up of fanstasias, dances and and tunes from Shakespeare’s plays; and in late Spring, Shakespeare and Purcell; music from the Fairy Queen and surely other works will include Dido’s song, “Rememember me but forget my fate,” and settings of Shakespeare by Purcell. My neighbor-friend, Sybille, was with me. She is also a widow, her husband also taken by the cancer epidemic (in his case a devouring pancreatic cancer). Downstairs they had had mulled wine and various sweetbreads. We’d had some, and since she brought her car, it was an easy drive home. I would not have gone but for her. I was much moved because this is the first time since Jim died I found myself having the kind of theater and music experience Jim used to find out for us regularly. I came home near tears and write this morning to record this renewal of dear memories through an experience. Also to tell of what this Consort has now become. This is the third HD film of a production of the RSC Shakespeare company that I’ve seen at the Folger Shakespeare library theater. Their Love’s Labor’s Lost was excellent as one of the first genuine attempts I’ve seen to present the play’s content seriously, but when it came to the play within a play, their concept couldn’t take in the humor or irony; unexpectedly their Love’s Labor’s Won (a retitled Much Ado About Nothing) was a disappointment: I had watched a Future Learn which focused on this production and it lead me to think it must be marvelous: it was very good but its dark or pessimistic interpretation was unable to make sense of the play’s supposed happy ending. Still both productions persuaded me that at every opportunity where a film of a live production (HD screening or encore) existed within my reach, I should go. I am now convinced the latest phase of the RSC company is as deeply rewarding as any phase that has gone before it. 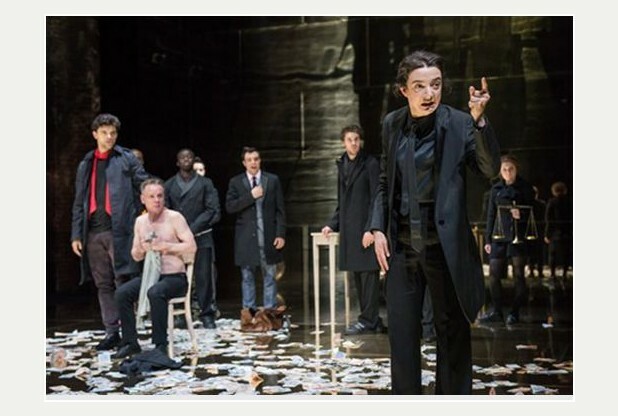 For the very first time in all the productions of The Merchant of Venice that I’ve seen, in this one directed by Polly Findlay, the character of Antonio and his relationship to Bassanio makes sense. 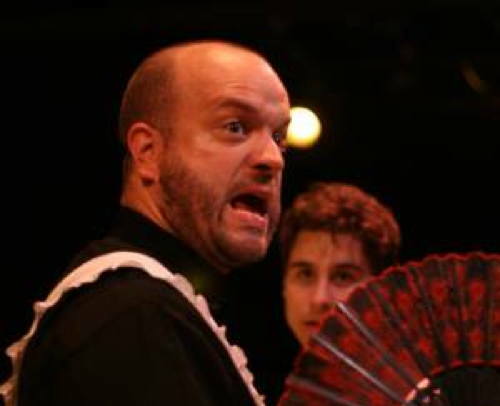 As the play opens, Antonio (Jamie Ballard) is on stage in a deep depression: the cause emerges as his love for Bassanio (Jacob Fortune-Lloyd) who loves Antonio in return but longs to marry Portia (Patsy Ferran), a wealthy beautiful Venetian — because Bassanio is capable of bisexuality, because he finds her attractive and compelling and to get her money. It is the deep betrayal of Antonio that this means that causes Antonio’s melancholy. Nonetheless, because he is an abject lonely man in his heart, he agrees to the bond with Shylock in order to supply Bassanio with the wherewithal to woo the rich lady of Belmont. The words of the last act which indicate intense quarreling as well as the poeticisms of heterosexual romance at the opening suddenly made ironic sense. At the close of the play Bassanio must go off to bed with his wife, and leave Antonio alone again. 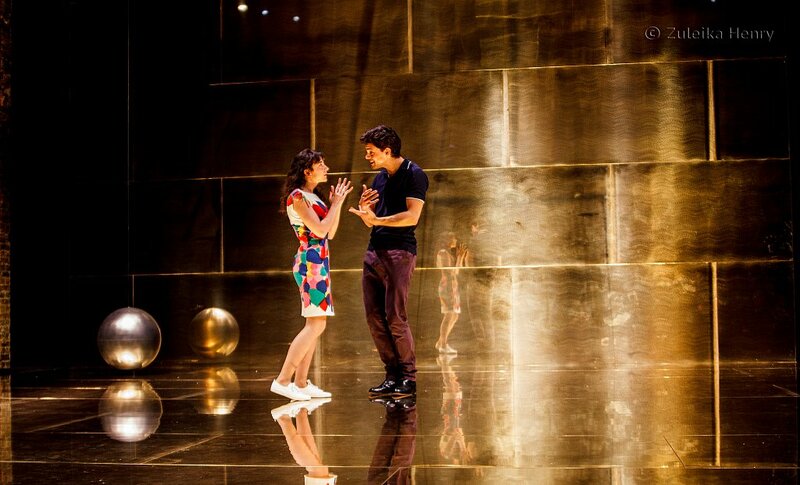 The stage was a wall and floor made of golden metallic substance, all smooth and glittering. All the characters who are active in choosing their fate (servants or hangers-on like Gratiano imitate) are out for money every time. Lorenzo (James Corrigan) wants Jessica (Scarlett Brooks) for her body but were the money not here he’d not be seeking to elope with her. She has to tell him about (Shakespeare’s words are there) the jewels, the casket and money to come to excite him to act. It’s clear from words that she is regarded as inferior. 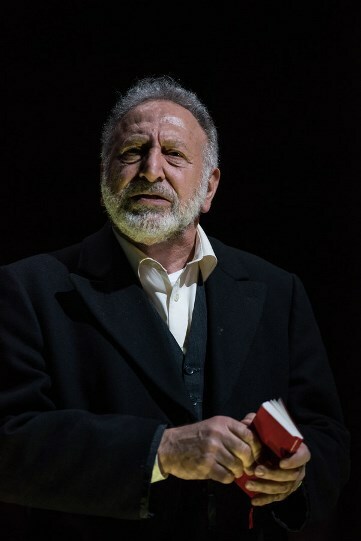 The production added an enactment which made Jessica feel bad that she had deserted her father (Makram J. Khoury) and was the abject person subject to Lorenzo as we see them exit the stage. The production put the anti-semitism of the text in your face. Makram J. Khoury looked like a caricature of a Jew, though what was brought out was that despite Shakespeare’s clear empathy for the man, Shakespeare’s presentation of the Christians as just as mean and amoral, greedy, hard as Shylock. This the first production I’ve seen that brought out how Shylock points out to the Duke were he to ask the Venetians to treat their slaves humanely they would laugh or just ignore him. Nonetheless, this Jewish man is a hate-filled figure; he says bitingly, bitterly of Antonio that Antonio is himself getting money by his trading and why should he the Jew not do likewise where he can, and says it seethingly. Shylock’s reaction to Antonio who openly despises and actually spits on his face (which the actor does twice! ), is natural but this sort of human reaction is rarely shown so clearly. We see humanity as it is, the thing in itself on both sides. Still the Christians seem more forgiving: they have one another to comfort them. Shylock had only Jessica and she fled; Tubal (Gwilym Lloyd) is a confidant but there is little emotional relation between them felt and Tubal is not there for very long. The scene where Antonio bares his chest to be cut up functions as a trope of torture. Shylock prepares to torture Antonio before our very eyes. The production add an enactments (gesture as well as Shakespeare’s words) which insisted on Shylock’s hurt at the loss of this daughter and her betrayal of him (as well as the loss of the ducats and jewels), but the bare cruelty and greed of the man was undeniable. The play’s text exposes him when he turns to ask for his money when he can’t have his pound of flesh without blood. When it is required of him by Antonio that in return from keeping one-half of his money until he dies and it goes to Lorenzo, he become a Christian, he grovels. This is the play. In the 21st century the gov’t of Israel has acted according to Shakespeare’s conception of how an ostracized alienated person, a Jew, would act. The money angle of the play is important. In Mantel’s Wolf Hall, Thomas Cromwell tells Henry Percy, the Earl of Northumberland, the world is not run from war sites or by swords but from Antwerp and by money transactions of bankers. In his mesmerizing series of lectures for Future Learn on Shakespeare’s plays, Jonathan Bate included a long section on the function of interest (usury) in making the Renaissance happen and talked of money and usury and Venice in his comments on this play. Love & friendship and money are the focuses of this play. I was not surprized to hear a number of audience members talking during the intermission as if in shock; and while the theater was packed as the film began, after the intermission, sufficient numbers of people had left to reconfigure the way people were seated so new people were sitting up front (where I was). Those who left couldn’t take it, didn’t like it? Not only was the Shylock too hard, but perhaps when Antonio and Bassanio kissed so passionately and made it clear they were the true lovers, audience members were also turned off. None of Shakespeare’s words were changed and I heard no one say that what was being shown was not in the play. I love when art is hard and candid in this way, shows you what you are or could be, shows what people hide because of socially acceptable pious norms. Were the production not equally hard on the Christians, I would castigate it, but it is as hard on them. I have not mentioned that Gobbo impregnates Portia’s servant (as Shakespeare’s words imply) but does not want to marry her – she has no money. The first two suitors, Morocco (Ken Nwosu) and Aragon (Brian Protheroe) are jackasses. The male cronies of Antonio and Bassanio unscrupulous roughs. Gratiano (Ken Nwosu again) is funny because he is so unguarded. 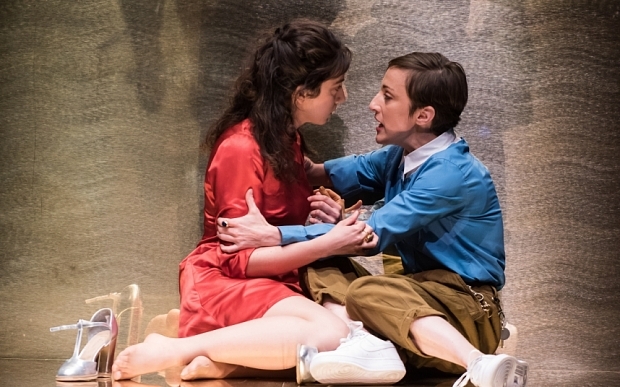 The RSC has turned The Merchant of Venice into the unsentimental tragedy it is, and demonstrated to me why 18th and 19th century critics and readers kept saying how real much real human nature Shakespeare’s plays enact. They came out on stage as a group but they did not (as is so common nowadays) break into a happy dance at the end. Even enactments of the tragedies sometimes end this way. I was glad they did not. People seem to want to forget that Shakespeare’s plays are plays meant to be read. Reading plays have existed since there were written down plays and exist still. The text also offers profound meditative material on law, justice, mercy, pardon (forgiveness) and (just as important) learning to turn a blind eye on what’s in front of you in order to carry on. Patsy Ferran carries or pulls off this difficult content superbly well. The business of “the ring” at the end of the play shows Portia that Antonio is Bassanio’s preferred love. It inheres especially of course in her fully-emotive and eloquent treatment of the several phases of Portia’s appeal to Shylock (the famous speech about mercy). When he will not yield, she turns on him to show him how words may be interpreted against him so easily. Never depend on your bond, your contract. Who has the hegemonic powe is the person who wins out in public life — public life shapes the private. And as a Christian male (who hides his homosexuality from everyone but Bassanio) it’s Antonio who holds public trumps. The point of the first scene where Antonio refuses to say why he is sad is to show him hiding what he knows is the reason for his sadness from his male buddies. He does not win in private life, but then Shylock does not either. I’ve wondered before if the title refers to both Antonio and Shylock, making them parallel. Both outsiders. Perhaps the production sought to disquiet and disturb complacencies beyond what is in Shakespeare’s text. The actress playing Nerissa, Portia’s servant, Rina Mahoney has had one of her arms amputated or it was lost in some dreadful accident above the elbow. She did not wear a prosthetic so that again and again the audience was confronted with the stub of an arm. Mahoney is small in comparison to Nwosu (Gratiano) and he swung her around in ways that suggested when out of sight of Portia, Nerissa would not be able to enact an imitation of Portia’s power. Samuels’ behavior as Gobbo put me in mind of Roy Kinnear as the bizarrely heartless theatrical Common Man in Robert Bolt’s play of A Man for all Seasons (as filmed in the Charleton Heston production). There is a new style of acting or delivery of Shakespeare’s lines afoot in all 3 productions I’ve seen: at top speed which imitates psychological reality and yet each word or phrase super-clearly heard so as to try to reach 21st century audiences who may never have read any Shakespeare play; there are editions of Shakespeare’s plays for students where on one side is Shakespeare’s English and the other a modern paraphrase, as if this were a dual-language text. I find this style acceptable to working well — though it must be said the mode relies on artifice of delivery which takes away from in-depth psychological presences. The only actor performing in the old style somehow more naturalistic way (stylized but differently, in this case wittily) was Protheroe, an older man playing Aragon, the second suitor who chooses the silver casket. Protheroe spoke more slowly, and it was a sort of relief to have this less demanding kind of projection. 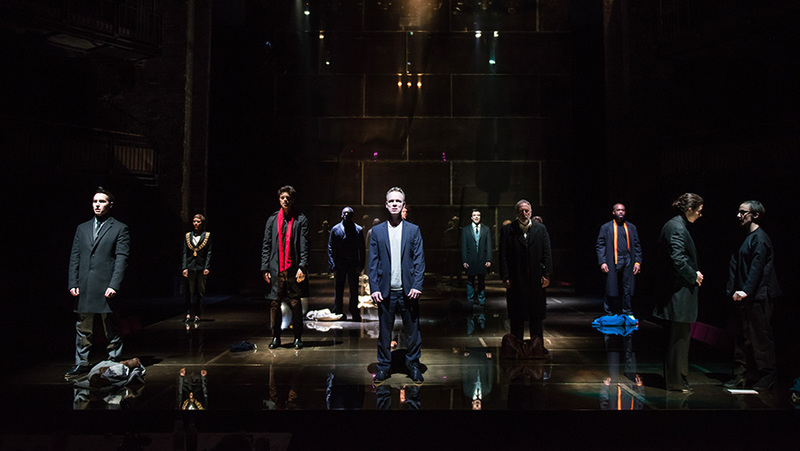 This is a courageous and intelligent production of Shakespeare’s Merchant of Venice, demonstrating again (as if we needed to be taught this) that William Shakespeare’s almost preternatural intelligence left us plays audiences and readers have not yet been able to come to terms with. The RSC is trying to lead the way. I went for a third year to a We Happy Few production: 3 years ago they managed to present a remarkable take on Hamlet in 90 minutes; last year a sophisticated modern-feeling Webster’s Duchess of Malfi. I can’t say that this year’s The Winter’s Tale is memorable for a uniquely perceptive view of the play. 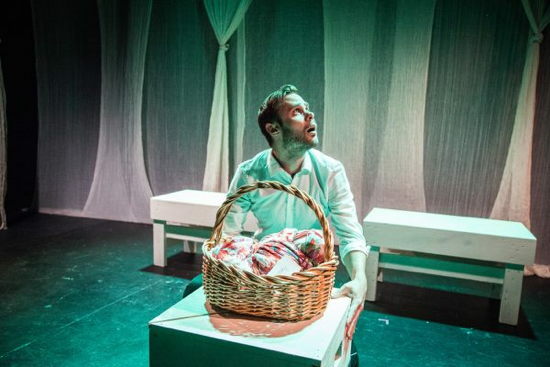 The play’s two parts (as cut), joyfully lightly transgressive comedy (Act 4 in Shakespeare) sandwiched between wild (Acts 1 & 2) tragedy and redemptive (Act 5) fairy tale does not leave a lot of room for psychological nuance (see Morgan Halvorsen’s review). Hannah Todd’s director’s notes in the pamphlet that serves a ticket and program showed she only came up with the idea this play is faery tale material we are supposed to believe in. An opportunity lost. Still, they held the audience’s attention — it was a small area, they were very close to us, and they cleverly handed people sitting in the first seats props to make us all part of play. I held a tambourine for a while. The actors all had strong moments, but Nathan Bennett as Leontes, Raven Bonniwell as Hermione, Katy Carkuff as Paulina, Kerry McGee as Autolyclus (trying hard to be amoral but since she was also Perdita, not quite distinguishing the role clearly), and Kiernan McGowen Antigonus, with William Vaughn as Clown and Florizel provided the most effective ones. What was most striking was how six people jumped in and out of at least 18 different roles, but while in each maintained strongly projected full-blooded acting. They also had such minimal costumes, the same scarves and capes were whisked about doing duty for several garments in tandem. Laughter came easier, and the actors played for laughs where they could; it therefore seemed more spontaneous than pity, which we were not given much time for. If you were listening to what Leontes and Polixenes threatened to do to others at the turn of a coin, and remembered that monarchs could torture, kill, starve, and make a life excruciating if they pleased and sometimes did so in Shakespeare’s period, there was more to the content than manipulative metamorphorsis. There is real terror in Shakespeare’s words, real anguish and now and again this came out, especially I think from Raven Bonniwell as Hermione. Since I’ve been reading and listening to Hilary Mantel’s Wolf Hall, I was again struck by the parallels between Henry and Leontes and Hermione and both Catherine of Aragon and Anne Boleyn, especially his sexual anxiety and distrust towards the latter precisely because she held him off (humiliatingly) and then showed she knew sexual acts that he could not believe a virgin would figure out herself. Shakespeare’s Henry VIII is a bold portrait of the tyrant Tudor in old age and nowadays I’m thinking that instead of placing WT with the dramatic romances from Greek stories, chronicles, and poetry (Pericles, Cymbeline, The Tempest), we ought to see it done as a pair with Henry VIII the second half. Have the same actor play Leontes and Henry, the same Hermione and Catherine. Unfortunately, there is only one performance left but (sadly) unlike the previous two years, it seemed half the seats were empty. In the previous years, there was not one empty seat both times. I felt the actors felt this lack of people, especially given how hard they were working to make too few props and costumes go very far. 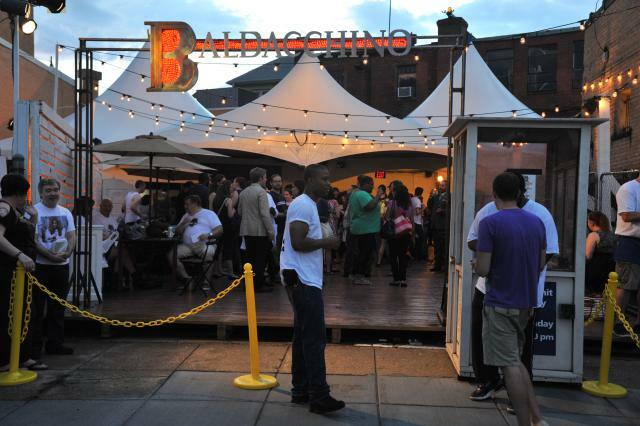 So if you read this tonight and live in the DC area, consider this one. Unlike too many of this year’s events, it is located in a place in the city close to a Metro stop so you really can get there by public transportation and on foot! There was no hope of my reaching Gallaudet College I now know. I would have seen the Guillotine Theater do an adaptation of Middleton’s Second Maiden’s Tragedy as Cold as Death, but (like It’s What We Do A Play about the Occupation), it appears to have been under-rehearsed. Two of the plays I went to and a third and fourth I couldn’t manage but was told about as awkwardly performed by a friend (Shakespeare’s The Life of King John, done as goofy comedy) seemed more minimally staged and costumed than previous years. In early years the venues were in condemned spaces with no air-conditioning; I hope I am wrong but this year has seemed more strapped for funds than the previous couple. So for me ends my second year of going to the Fringe Festival on my own. I enjoyed this play and Ellouise Schoettler’s The Hello Girls.